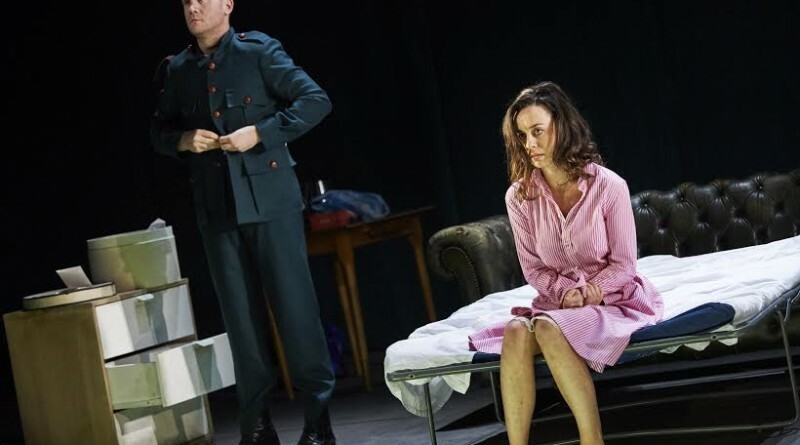 The latest resurrection of The Plough and the Stars is an exciting, bold and modern take on 1916 100 years later – with homelessness, poverty and social conflict at the heart – matters the English director feels Sean O’Casey would be “angered” at today. The script may be set in 1915/16 as political and social troubles boil over in households across the state and finally on to the streets – but The Abbey’s newest version of this classic play has cleverly evolved to become relevant in 2016. The liberating incarnation, accompanied by modern dress and dance music interludes, was interestingly crafted by an Englishman – who humourously refers to himself as the ‘old enemy’. 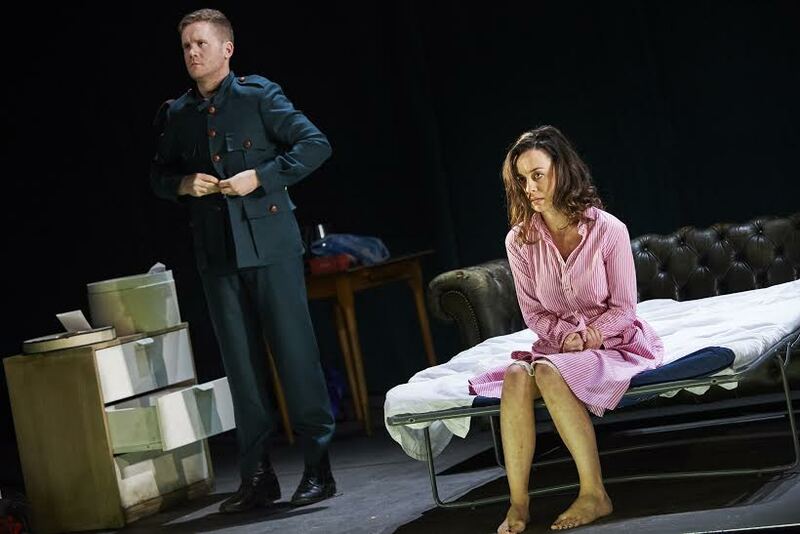 Sean Holmes, artistic director at London’s Lyric Hammersmith, has deliberately flirted with danger, creating a contemporary take on an Irish classic, especially as an Englishman at this time in our history, as we mark the Rising. But the choices he has made as a director, are rewarding, because the performance is invigorating and challenging – a true delight for theatre goers who favour home truths. 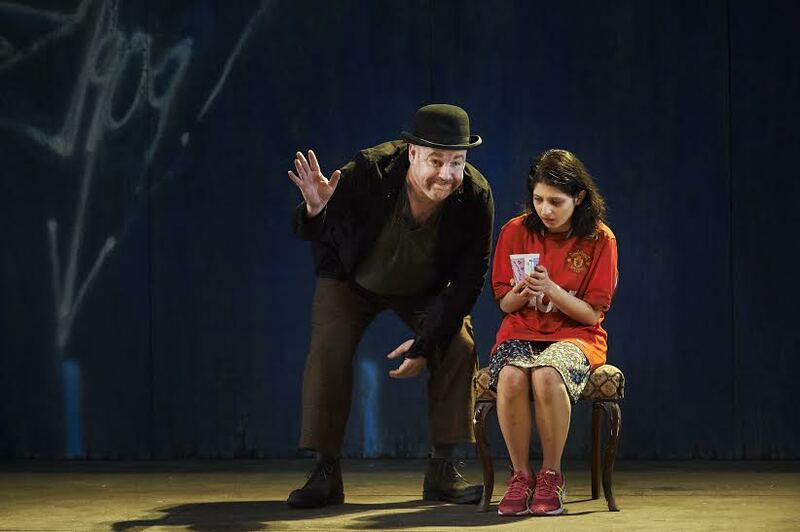 An innocent but tragic figure invites us in to the story in the opening scene – Mollser (Mahnoor Saad) clad in a Manchester United soccer top – weakly singing the Soldier’s Song in Irish. It is disturbing to watch as the child then coughs and splutters blood from her mouth over the lyrics on a sheet of paper she is holding. It was clear, even to strangers to this play, the little girl’s future and that of those around her was bleak. Perhaps Mollser is a symbol of poverty, of an ailing health system that still exists in Ireland today. No matter how hard she coughs and how apparent her illness is, the child is not seen by a doctor. Her end is heartbreaking but of course, predictable. The fact this version was created by an ‘outsider’ is perhaps the only way that introducing dance music, a shopping trolley, trainers and a Manchester United jersey in to an O’Casey play could become a possibility. Though, no doubt for some O’Casey aficionados this all may be a little too sacrilegious. 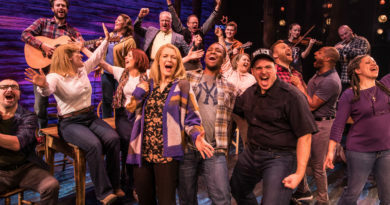 However, regardless of opinion on style, the social and political messages that O’Casey wanted to highlight are still very relevant today – and these are issues at the core of the play. “I had to speak to Ireland now as well as then,” Holmes said. “The amount of homelessness in this city is much more visible that London. It reminds me of London in the early ’90s. “Homelessness is a problem in London but watching the news and discussions about contemporary housing is very shocking and it is very different to London. “The last few days I have become sensitised. I am now really angry about it because i’ve been here longer. It’s really bad. I think O’Casey would be really angry about it. There’s no homeless people (in the play), but in the first act the structure is like contemporary housing. The play is speaking to people, the economic situation people are in. Straight away the audience are plunged in to a musical interlude – reminiscent of loud dance sections from Trainspotting. It’s hard to believe this is an O’Casey play – shouldn’t someone be waving a glow stick? The performance unfolds naturally and humorously then in to a family drama. We meet old favourite, Uncle Peter (James Hayes) who fusses around a crisp, white shirt drying by an electric fire, before donning his military regalia as the Young Covey (Ciaran O’Brien) taunts him, laughing and mimicking the elderly man. Though living in poverty, the family, all squashed in to a tenement, maintain humour and there are flickers of devotion sadly later replaced by ego, anger and fear. The closeness between Jack (Ian Lloyd Anderson) and his young wife Nora (Kate Stanley Brennan) – who attempts to cling on to femininity and class as she is trailed through a life headed for destruction – is at times touching yet fleeting. There are moments of real passion and fun, when the pair attempt to rush love-making when the tenement is finally empty. The sofa is hurriedly pulled out in to a bed and clothes tore asunder while comedy then prevails as Jack grabs a microphone out of nowhere to sing to his Nora. The whoops of laughter from the young woman, rolling around on the bed, half dressed, is a comedic and romantic take of a newlywed couple struggling to hold on to love in times of poverty and political turmoil. Only minutes later and a knock at the door signals the end of such passion between the pair as Jack is whisked off to take his place in the Citizen’s Army to fight in the Rising and Nora is blamed for hiding the letter which had called her husband to battle. For the first time we see Jack, who had seemed a serious, yet loving husband, turn violent as he pins Nora down on the bed, blaming her for trying to keep him away from war. Later we slip back in to the modern day, as another dance interlude welcomes us to a bar room. From here, the revolution is televised. The call to war is made and Jack vanishes as the Rising gets underway on Dublin’s streets. We see Nora once again, pregnant and troubled. She has risked her life and that of her baby’s to follow “my Jack” to battle – to bring him home but in the end her mission is in vain. Though she sees him once more, shares one more kiss, again Jack’s call to war takes priority over Nora and the unborn child as he again pushes her and forces her away. As Nora loses her baby and Jack returns to battle and to his death – the play takes a dark turn it cannot return from. The audience sees a coffin centre stage and then learns Mollser is holding the baby inside the casket. There is only one glimmer of hope left. A character that had seemed contemptible, Bessie (Eileen Walsh) displays compassion for the first time. Bessie, who had been mocking her fellow Dubliners with Rule Britannia and her opinions favouring the British empire, had suddenly forgotten her own bitterness, alcoholism, alignment to the British – her son, feared dead, a soldier in the First World War. At this moment, it seems nationalism, politics, do not matter one jot. Bessie is a woman, intent on helping another woman in despair. As she nurses Nora through the nights, all thoughts of war are forgotten until the inevitable gunfire sounds to signal Bessie’s end. The strongest performances come from Janet Moran, a light-hearted but irresponsible Mrs Gogan, who ignores her own daughter, Mollser, in favour of the company of friends and merriment. But we see a transition in Gogan as she is poisoned with guilt for not doing more to care for her girl. Fluter, the kind-hearted drunk, (David Ganly) is also very strong as he offers comedy and at times pantomime as light relief to the audience – but then we see steel set deep within the clown, as he questions a British soldier who enters their tenement hideaway on the lookout for a sniper. Brennan does not disappoint as Nora with a strong, heart-breaking performance of a woman who has been pushed beyond the brink. Ciaran O’Brien, who plays Young Covey, seems to be a natural comedian on stage and his presence accompanies Ganly and Hayes unquestionably. But Walsh, though an irritant in the background, causing offence to the Dubliners throughout most of the play, is without doubt, the star of the show and her end was bitterly felt by an audience hooked on the site of a woman on the mend. 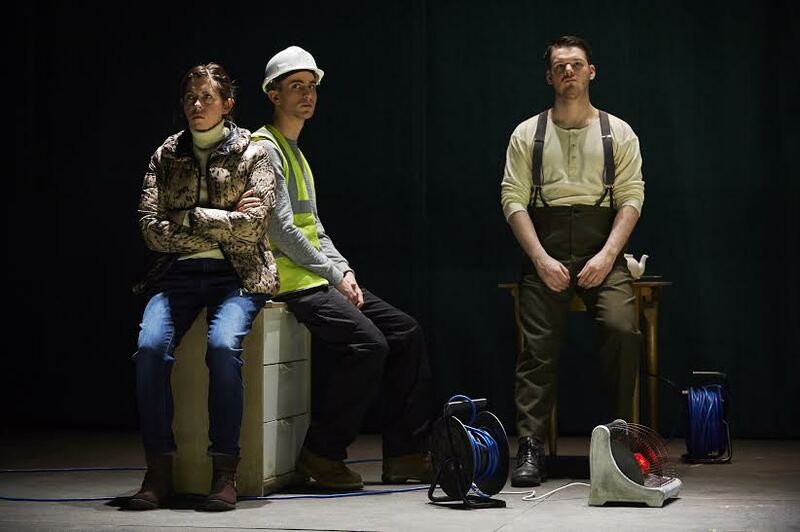 As the characters stand together at the end of the play and the British soldier stands centre stage in song, it seems possible, as this Irish man’s classic – reshaped by an Englishman – that we have come to an understanding as a people. Are we that different after all? The Old Enemy and us? After all even the director had to admit his grandfather was a Tipperary man. The play and most of the audience that night perhaps walked out of the theatre realising there is one key thing about the Irish and the English. We are all human beings. We all bleed, love, and hate. ← Brave cyclists save a cow whose head is stuck in a tree!!! !